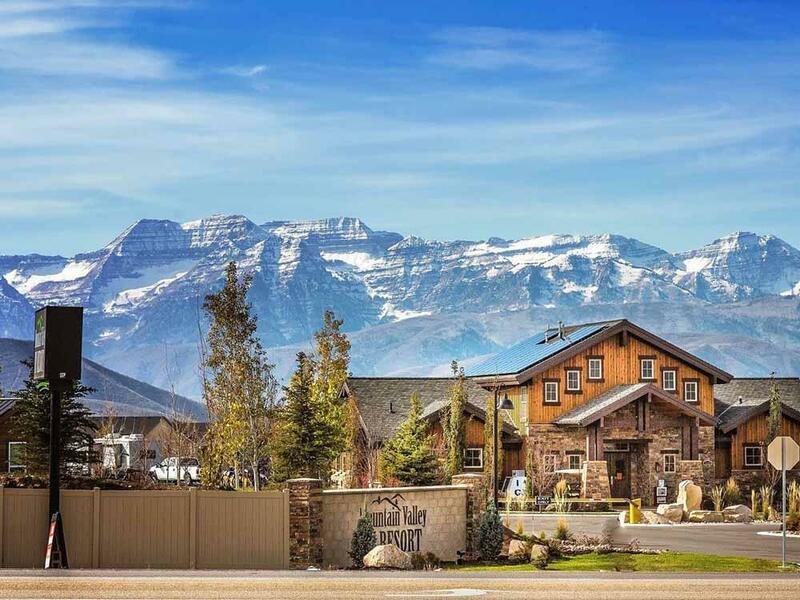 Located in the beautiful Heber Valley, home to blue ribbon fishing on the Provo River & over 90 holes of championship golf. Big rig friendly, cabins & tent sites. 2 beautiful pools! Your vacation for lasting memories. Beautiful resort! The grounds are very well maintained. We experienced amazing customer service from each and every employee we were in contact with. Their laundry is top notch and the fenced dog parks make life so much easier with pets. This is definitely the nicest RV resort in Utah. This place was awesome!! Excellent service, polite, professional and very friendly. The park is very clean and all facilities are in excellent condition. Highly recommend a stay at this location, we will return for another stay. We have stayed up here at Mountain Valley RV Resort a few times now, and this place is Beyond Amazing in every way. The staff is so friendly and helpful. They go above and beyond, to make your stay enjoyable and memorable. they are all amazing. The resort is so clean and well kept. We LOVE, LOVE THIS PLACE!!!! We will most definitely recommend it to our friends and family, and we will definitely keep coming back. They book pretty fast here because of how wonderful this place is, so FYI book as soon as you know when you want to go. THANK YOU AGAIN, MVRV!!! I have driven by this park many times. We wanted to take the grandkids out for a few days and decided to try this park. The park is very, very nice with fantastic sites. Restrooms and pool were very clean. Occasionally we would hear some road noise. The only complaint I have is on my site the sewer connection is lower than the concrete pad and I was unable to get a good air tight sewer connection. This is the nicest resort we have stayed in. It is beautiful, clean and well maintained. The dog park was awesome. Other than some pretty silly rules that make no sense it was perfect. I would love to stay there again. Always a must stay going on a trip or coming home. Great peaceful location that's easy to get to, immaculate grounds and facilities wide roads, level sites, utilities perfect.... New section is beyond amazing with the single greatest dog park ever! Having 21 and over section has only enhanced this already amazing park with outstanding customer attention. This RV Park is clean, neat, and orderly. We had a good stay, and appreciated the helpful staff. Nice play to stay with great amenities and convenient location to nearby sites. Only issue I experienced was customer service with the camp site staff. Otherwise, would visit again. WOW!!!!!!! They met me as I pulled into the complex, then a follow me golf cart to site! Then asked if I wanted them to hook up water, sewer, etc! By far a 10+ for our trip so far. they say they are DOG friendly huh. we also PAID for our 3rd little dog,our dogs were NEVER outside without us. And 2 different CAMP HOST HARASSED my husband. the OLDER man told him to shut those dogs up. but we have to listen to screaming kids oh yeah we were in the aldut section!!!!!!!!!!!!!! WON'T stay there again,to bad the place was beautiful. Very nice campground. Friendly staff. Great view of mountains! Nice, level concrete pad with good amount of grass between sites. Nice clubhouse, pool, etc. We only stayed for 3 nights but would like to come back to this campground again in the future. I would give this a higher rating if it were close to a lake, ocean, etc. I would recommend this park to others. Beautiful park with helpful and friendly staff. I have a 43 1/2 foot Toy Hauler and I use the deck on the back to sit and take in the spectacular view of Mt Timpaanogos. This was my second time at Mountain Valley RV Resort and I will be coming back. This is our second stay here. 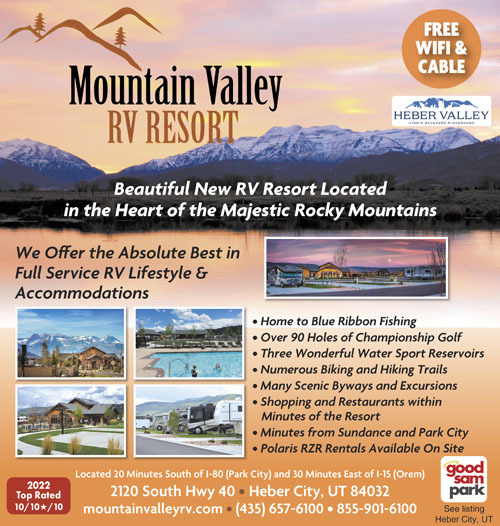 We have stayed at RV parks across the country and Mountain Valley is definitely superior to all others. It is situated in the beautiful Heber Valley with endless outdoor activities for all to enjoy. Mountain Valley RV Park offers concrete pads, great amenities, very friendly staff, and now they offer daily garbage pick up. The rates are very reasonable and I would even pay more for this park. The sites are large and there is plenty of grass between each site. They are expanding. so more RV's will be able to stay here. They offer the best in full service RV lifestyle and accommodations. Really lives up to the name "RV Resort". Great staff, facility, and location. Love the way shower facilities are set up as a private shower and bath room. Beautiful location and easy access. Will definitely stay here any time we're in this area! Level sites, great amenities and super clean rest rooms / showers. This was a wonderful experience. We took our two daughters (adults) and a grand daughter and stayed five days. It can be totally classified as a Resort and we loved it. We took walks, played in the pools, played in the game room, etc. Everything was spotless, well manicured lawns, garbage picked up outside our door every morning by10:00 am. I want to live here! Definitely will return here many times. We spent one night here on our way to Wyoming. What a wonderful resort! Check-in was easy, our pull-thru site had a cement pad, and the views of the mountains were incredible. The pool/spa area are very nice and the restrooms were sparkling. I would definitely stay here again! Thank you for your stay with us at Mountain Valley RV Resort! You are absolutely right that the mountains are spectacular! We look forward to seeing you the next time you are in the area and remember to plan a few nights because although the mountains are incredible, they're even more fun to go play in :) Please don't hesitate to ask us about amazing scenic drives and other activities in the beautiful Heber Valley. They thought of everything when they built this RV Resort. We enjoyed staying here more than any other resort in a very long time. Great wifi (with the option to upgrade to a faster speed for a nominal charge), lots of cable channels to enjoy and nice wide spaces. We have a very large rig and were able to fit into a back in spot no problem. The staff is super friendly and goes out of their way to help in any way they can. Great playground for our little one and the pool, hot tub area and clubhouse are truly resort style. Laundry facilities were spotless. I only peeked at the restrooms but they seemed very nice as well. We will be back for sure and sooner rather than later. What Makes this Park Family Friendly? Good Sam Camping gives special recognition to RV Parks that provide family-friendly amenities, activities and services. On-site activities for children (such as board games, arcades, ring toss, badminton, recreation for adults and children like - hiking, canoeing, bicycling, fishing, boating, horseback riding.